The itinerary assumes arrival to and departure from Shannon Airport. If that is not the case we can easily alter the running order to take account of your plans. Your tour will be a private one, specially arranged for your party – you will not be joining a larger group. This means that should you require any customizations to the itinerary or any other aspect of the tour this can easily be arranged. 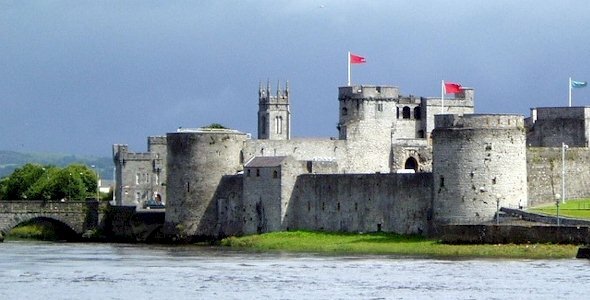 King John’s Castle in Limerick, which has been fully restored, was built in 1210 “to dominate the bridge and watch towards Thomond“, and is one of the finest specimens of fortified Norman architecture in Ireland. Adare is a perfect example of an estate village and was developed by the Earls of Dunraven who lived at Adare Manor. This 18th Century castellated manor house, with towers, turrets, and stonework ornamentation, is now a luxury 5 star hotel. Explore the breathtaking scenery of the Ring of Kerry, travelling past some of Ireland’s highest mountains one one site and most spectacular coastal scenery on the other. Our journey will take us through the villages of Cahirciveen, Waterville and Sneem, before we return to Killarney for a guided tour of the elegant 19th century mansion, Muckross House . Muckross House was built for Henry Arthur Herbert and his wife, the watercolourist Mary Balfour Herbert.. Building commenced in 1839 and was completed in 1843. 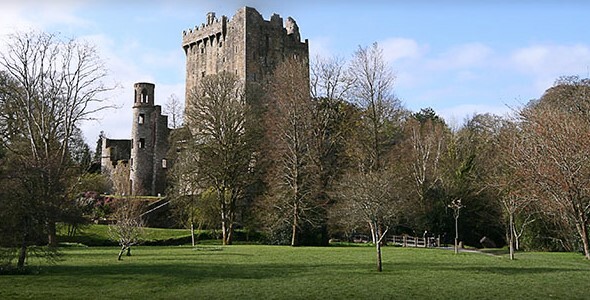 This morning we leave Killarney and travel though the Agricultural heartland of south Ireland toBlarney and its famous castle. Kissing the famous stone at here is said to impart the gift of eloquence, but you must be suspended upside-down to achieve it! The Rock of Cashel was the seat of the Kings of Munster from the 4th century before being handed over to the church in the 12th century. It remained the seat of the local Bishop until 1647 when it fell to the Cromwellian army. Kilkenny Castle dominates the beautiful medieval city of Kilkenny. Built in 1172 it was bought by the Butler family in 1391 and remained their home until 1935. A stroll around the city, which is extremely rich in well preserved medieval buildings, is well worth while. The Cistercian Abbey of Jerpoint, close to Thomastown, dates from 1158 and was one of the most important monastic settlements in Ireland. The port city of Waterford is famous for its Crystal Factory – a tour is highly recommended. 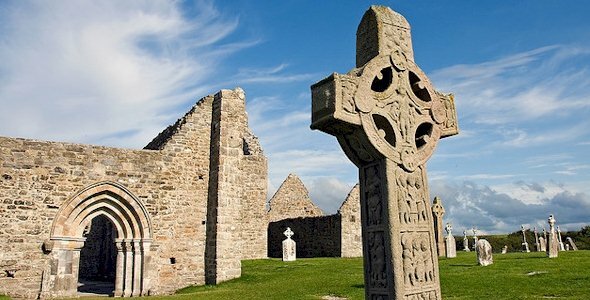 Clonmacnoise is a monastic settlement, famed for its scholarship, which thrived from the 7th until the 12th century. Many Irish kings were buried there. Coole Park was once home to Lady Gregory who regularly played host to Irish poet W.B.Yeats. Although the house is long gone, the magnificent grounds and lake, with its famous swans, are worth visiting. Yeats lived at nearby Thoor Ballylee, a small castle on a more ‘domestic’ scale than many we have seen. Connemara, an area of rugged landscape, bogs and mountains is known for its clear light and unspoilt beauty, characteristics that make it specially loved by artists and photographers. 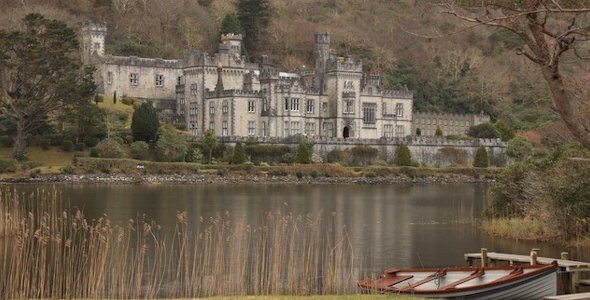 Kylemore Abbey was built by Mitchell Henry as a gift for his wife and is now a select private boarding school for girls. Visitors are restricted to the gardens and lakeside walks. On the return trip through the Maam valley you are likely to see locals harvesting turf, used as fuel, from the bog still using tools and methods a thousand years old. The Burren covers 100 sq miles of lunar like rock with underground rivers, caves, turloughs and ancient burial places, some dating back more than 3000 years. At 800 feet above the Atlantic Ocean a walk along the Cliffs of Moher is a bracing experience and will certainly give you an appetite for lunch! 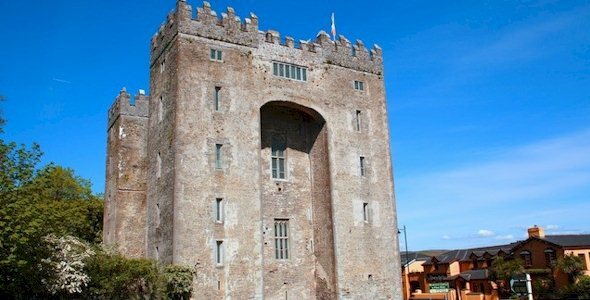 Bunratty Castle is host to regular medieval banquets during the tourist season and the adjoining folk park, with reconstructions of typical rural dwellings, including a full village, is well worth seeing. Today’s activities will be determined by departure times. 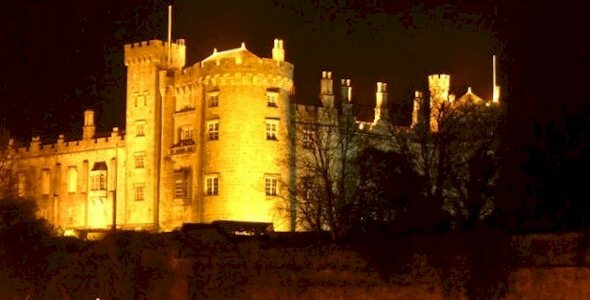 For those with late flights it is a good opportunity to see any places that were missed on the earlier visit to Limerick or to spend a few more hours at Bunratty Castle and Folk Park. This tour is concentrated in the West and South of Ireland and while the pace is easy, there is a lot to see and do each day. However, because every night is spent in a wonderful castle, we don’t generally start too early or arrive at our destination too late, so that you have ample time to enjoy your nights to the full.